Lives are at stake. This much is clear from the murders in Bangladesh. One death is far too many. The big organizations of Muslims can really send out a strong and powerful message that despite theological differences, there is no room in Islam to so poorly treat our LGBT Muslim brothers and sisters. A Bangladeshi LGBT rights activist, Xulhaz Mannan, and his friend were brutally hacked to death by an extremist group for "promoting homosexuality." 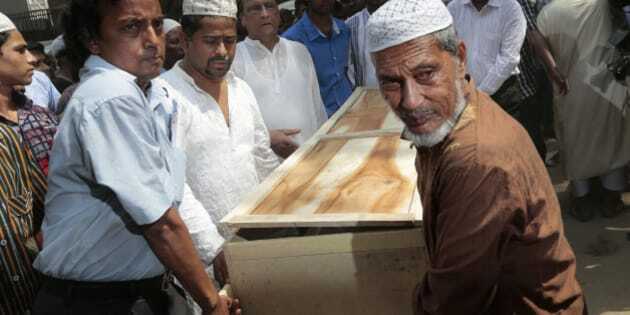 The funeral picture showed local community members and Muslims offering his funeral prayers. This clearly draws the line between those who see religion as a supremacist ideology and those for whom it is about being a better human being. However, it also indicates that it is indoctrination against blasphemy, apostasy and homosexuality that instigates young men to justify murder. This necessitates that Muslim community leaders will have to intensify efforts to destroy the poison of medieval supremacist doctrines that are touted by zealots addressing their hollow identity crisis. Such efforts are warranted, as death threats against LGBT Muslim activists have been issued even in places like Denmark. A harrowing article showed how the loved ones of LGBT Muslim activist Michael Sinan suggested that he stop participating in interviews and programs for his own safety. Sinan mentioned that despite getting three death threats, not much was done by the local police or the LGBT organizations. This is extremely unfortunate, for apart from experiencing homophobia, LGBT Muslims also have to contend with anti-Muslim bigotry. Such prejudice is rampant, as evidenced from the many negative comments and messages such activists receive online. Despite theological differences, there is no room in Islam to so poorly treat our LGBT Muslim brothers and sisters. Sinan also mentioned receiving acceptance and inclusion in many Muslim communities; however, it is crucial that such support be made public to send out a strong message that Muslims have zero tolerance for bullying, abuse and discrimination against some of the most vulnerable members of their community. Indeed, it is time that false analogies of vulnerable LGBT Muslims with the people of Lot are put to an end. There is absolutely no equation between the lives of our children, our faith-based brothers and sisters, our own flesh and blood, with Lot's people, who displayed obscene conduct of inhospitality, coercion and exploitation. Centuries have passed by with the perpetuation of such false constructs, but now that we are able to better understand human existence, that must end by revisiting the eternal core kernels of faith -- mercy, justice, compassion and love. The life of Xulhaz Mannan cannot be returned, but his legacy can and should be kept alive. Similarly, against the backdrop of death threats and demeaning messages, we can all band together to stand by Michael Sinan and other marginalized LGBT Muslim activists in this hour.